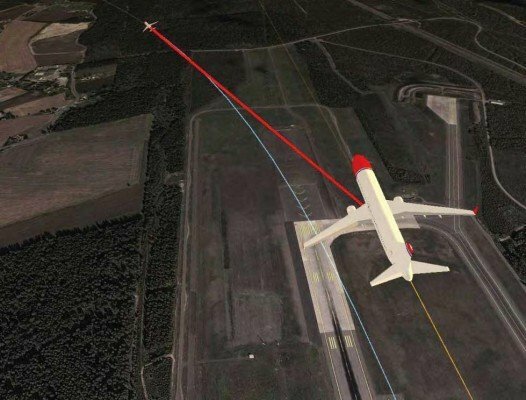 A call-sign confusion between two Norwegian Air Shuttle Boeing 737 aircraft led to near miss occurrence at Oslo Airport in Norway, according to an investigation report. On 31 October 2012, an aircraft proximity situation occurred between two Boeing 737-800 passenger aircraft from Norwegian Air Shuttle during a simultaneous missed approach (NAX741) and departure (NAX740) at Oslo Airport. Flight NAX 741 (LN-DYC) was arriving from Trondheim Airport, Norway with a strong tailwind on final approach. The investigators believe that the flight crew on NAX741 had unrealistic expectations regarding the possibility of being stabilized no later than at 1000 ft Above Field Elevation. The decision to initiate a missed approach procedure was taken at a late stage and was unexpected by the final controller and tower controller. NAX741 then came into conflict with the simultaneous departure of Flight NAX740 (LN-NOM) bound for Trondheim. Visibility conditions were such that the tower controller could not maintain visual separation between the two aircraft. Both were climbing, one after the other. The tower air traffic controller instructed NAX741 to divert west. A mix-up of call signs occurred and led to NAX740 executing the clearance given to NAX741. The minimum horizontal distance between the aircraft was approximately 0.2 NM (370 m) whereas the vertical separation was 500 ft (152 m). AIBN concluded that the situation contained a real danger of collision, but further escalation was prevented because the flight crews and tower controller showed good situational awareness. The AIBN considers established and practiced procedures to be conductive to recognizing situations and averting them before they become critical. Data from the Cockpit Voice Recorder (CVR) was not secured in this incident. CVR data is important to understand the sequence of events, and the AIBN therefore sees it as unfortunate when CVR data is not secured.